What is the lost Radeau? 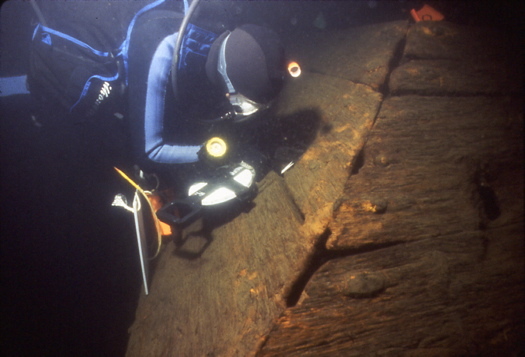 The Radeau is a 250 year old shipwreck-- almost completely intact-- that looks like something made by Hollywood. And it's in the middle of Lake George. It was part of the sunken fleet of 1758. In 1757 Fort William Henry was destroyed in the French and Indian War so in 1758 there was no fort to protect the British fleet in the winter time. 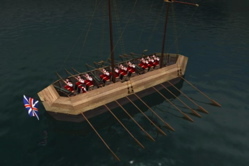 The British purposely sunk some of their own vessels in shallow water to protect them from the French, with the idea that later they'd use manpower and engineering to raise them. Most of them were smaller vessels called bateaux which were made in Albany and Schenectady (the bateaux factory in Schenectady was right across from Schenectady Community College). But the Radeau or "Land Tortoise" was much bigger. It's a 52 foot floating battalion. It's like a fort. It was designed to protect the rowers and the gunners. It has 7 sides and the angles deflected cannonballs and musket fire. Today the same shape deflects radar. If you look at modern day warships, the weapons are not outside, they are hidden-- like they are on the Radeau. We like to think of it as a Da Vinci type vessel from 1758. They weren't able to raise it. It sunk more than 100 feet below the surface of the lake. Basically it's in a refrigerator. It's perfectly preserved like that piece of food that sits in the back of your fridge. There was a lot of serendipity. I'm the Executive Director of a not for profit corporation called Bateaux Below, which studies and helps preserve shipwrecks. We knew some of the smaller 30-35 foot bateaux were out in Lake George. One day back in 1990 we were out looking for them with sonar equipment. When it was time to come in we decided to just leave the sonar equipment down for the return trip. Minutes before the end of the trip it detected something with seven sides. Nature doesn't make anything with seven sides, so we knew it had to be something man made. We never imagined in our wildest dreams that the Radeau had survived. We thought it had washed away and maybe became a hulk on shore and just disappeared. We worked for years to get it declared an underwater State Park. Now we're working to let people know about it and make sure they take care of it. We've spent years mapping it. It's now on the National Register of Historic Places and it's one of only six (shipwrecks) in the country to be designated a National Historic Landmark. It's an underwater state park? How can we see it? If you're on Million Dollar Beach at Lake George and you look about a mile and a half to the north there's a big white mooring buoy-- that's the buoy that marks this site. You have to be a licensed diver to see it in person. About 125 or so divers a year register to dive it. It's a deep dive, so you have to register. If you're not a diver, you can watch the documentary we made about it called "The Lost Radeau" . Also at the end of August there's going to be this really cool tri-exhibit. We've joined forces with a scientist and an artist in something called Raising the Fleet : the art/ science initiative. The art is based on the miniature images of the shipwreck. Protozoa that live in the sediment and crawl around shipwrecks are introduced onto the miniature drawings. It's a combination of art and science and it really pushes the envelope. The art will be on display in The Courthouse Gallery in Lake George, divers will be able to see some of it on special easels around the shipwreck and folks who can't get to these sites will be able to see the exhibit on-line. Shipwrecks and lake monsters are kind of an extreme hobby. Why do you do this? I guess I could be mowing my lawn-- but I'd rather be doing this. 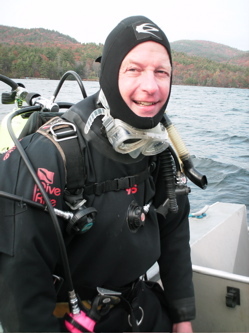 I make over 100 dives a year-- not just in Lake George. But with the Radeau, it's like a child, you know? And you want to make sure this child is going to be taken care of and have longevity. The people I work with --they're kind of like my family. And my living room is underwater. You spent more than ten years chasing lake monsters before you started chasing shipwrecks. Did people treat you like you were, you know, a little crazy? Oh yeah! Sure, a lot of people thought I was crazy for chasing Champ. Even when I tell people I study shipwrecks a lot of them look at me like I'm crazy. But these things tell us an an awful lot about our world and ourselves as a species as we try to give meaning to things we don't understand. I taught history -- and our history books have many missing pages. Archeology is a good way to fill in some of those missing pages or test the historical record. It's not so much about the artifact or cultural icon you find, it's what that item tells us about people of the past. I'm curious about these people in Lake George who 250 years ago rode these vessels and why they were there and the hardships tha they endured and I think that these pieces of wood give us insight into that . The final frontier isn't space, it's our larger lakes and oceans. And hopefully this will help the fund for human knowledge. Top photo: Dr. Russ Bellico/Bateaux Below, Inc. Inside photo of Joe Zarzynski: Steve Resler/Bateaux Below, Inc.
Great post! Makes me wanna go take pictures underwater. Fascinating stuff! I would never be able to dive to it though...no way, too creepy! I'd imagine there are lots of shipwrecks in Lake George. There's a long history of people shooting cannons at each other at both ends of the lake, so it would only make sense that a boat sank once in a while. Nice feature :) Steve Resler is my father, he does work with Zar for this! There is a long history is shipwrecks in Lake George, actually. The British would often scuttle or burn their ships in that vicinity rather than let the 'revolutionaries' get their hands on them. You know what else is funny. Itâ€™s called a â€œlandmark.â€ But itâ€™s totally not on land. Hilarious. Sounds like a good one for Gallagher. "The shipwrecks were easier to find because-- you know-- they actually exist"
@jackers - He meant one of six shipwrecks that are national historic landmarks. Thanks for the heads up. We went in and clarified it. Interesting article. I wonder how much underwater archeology is being destroyed by the Hudson River dredging project? We could use Zarr's expertise over there. Iâ€™m with Tim. It's a travesty that they're trying to remove the historically significant â€œtoxinsâ€ from the Hudson. Those PCBs are part of the river's cultural heritage! A year ago, I (-S) said: " Great post! Makes me wanna go take pictures underwater."